I LOVE KIMCHI. 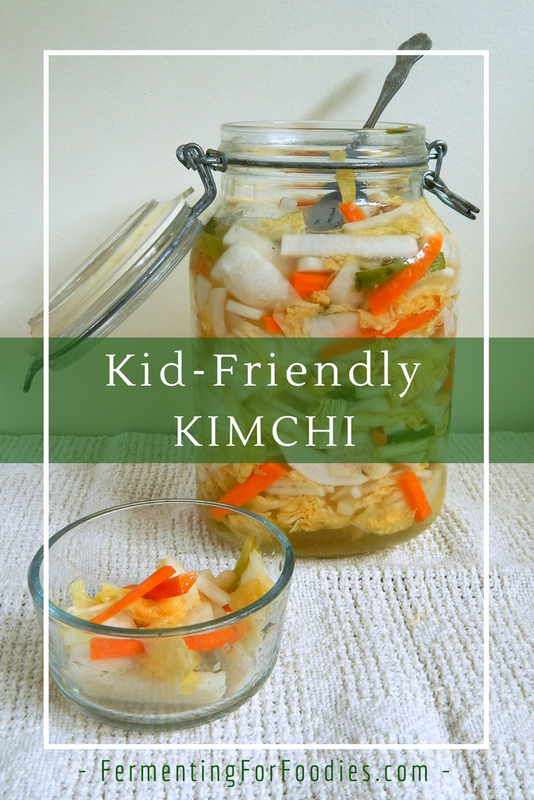 It’s my favourite condiment, which is why I created this kid-friendly kimchi. Eaten fresh, this kid-friendly kmichi is sweet and salty with a slightly flowery flavour. Dissolve the salt in the water to make a brine. Roughly chop the cabbage, and dice the radish, carrots and green onions into sticks. Mix the all the vegetables together. Pack into 2 mason jars. Dived the brine and pour over to cover the vegetables. Make sure all the vegetables are submerged. Allow to ferment in a cool location for up to 3 days. It is traditional to eat kimchi while it is still in the sparkling stages of fermentation. 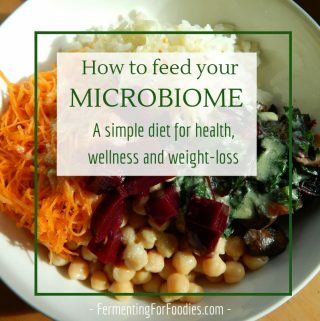 Place it in the refrigerator to stop fermentation. -This is a vegetarian, no-spice kimchi. Here is a recipe for spicy vegetarian kimchi, that I absolutely love. I usually make a spicy version and a no-spice version all at once so everyone in our house is happy. 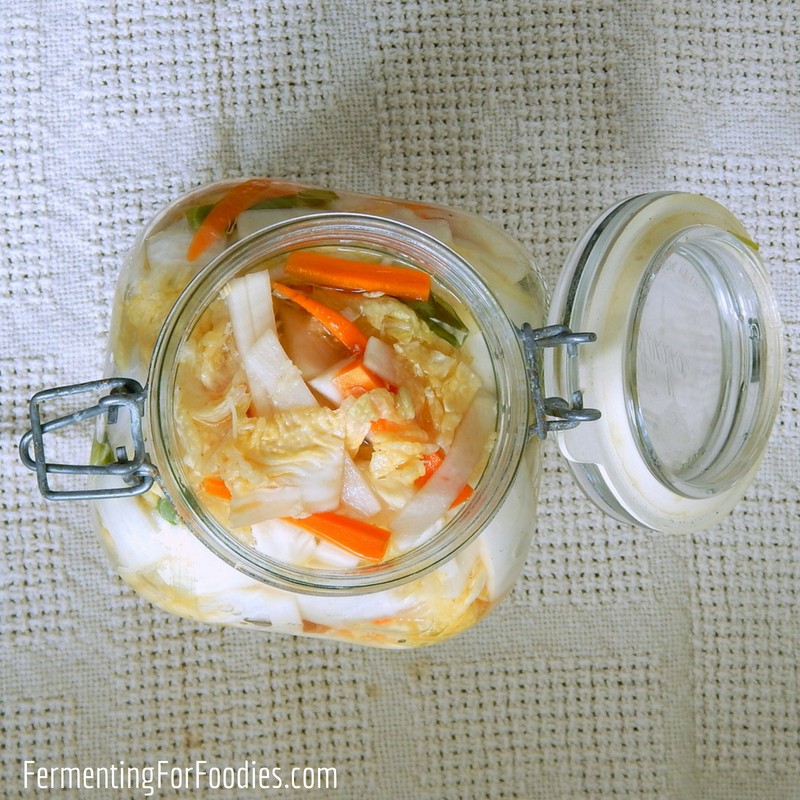 -Kimchi is generally eaten fresh (after 3 days of fermentation.) It will be sweet and sparkling for at least a week, after which it slowly becomes more sour. Either way it is probiotic and delicious. -Napa cabbage really is the best. However, if you can’t find it in your local supermarket, use a savoy head instead. Fresh kimchi is typically served along side of every meal. It’s eaten like a salad or pickles. It is delicious all on it’s own, or served with bread and cheese. Sour kimchi is generally added to prepared foods. 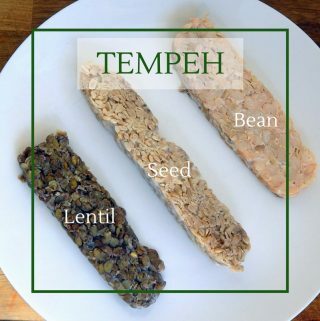 It has a stronger flavour, and can take the center-stage in soups, stews and stir-fries. It’s great base for a quick meal, like in this easy kimchi soup.